One thing the Internet couldn’t do away with is the demand for customer service. Even though some early birds sang the song of no involvement of human support, that hasn’t happened.Live Chat is a common online service tool today and if you have some catching up to do, you must do it fast. Customers like ease and speed of self-service on the websites of their favourite brands. If they run into difficulty, however, they’re inclined to just give up on your online services or on you and maybe for at least the next couple of weeks. Statistics published a couple of months ago have stated that 53% of shoppers have already used Live Chat more than once and this percentage is increasing in figures of tens. With the advent of faster technology and better internet it is all soon going to converge into who serves the customer better. More importantly than anything else, it is vital for you to know the gaps in your online business and to fill them well. 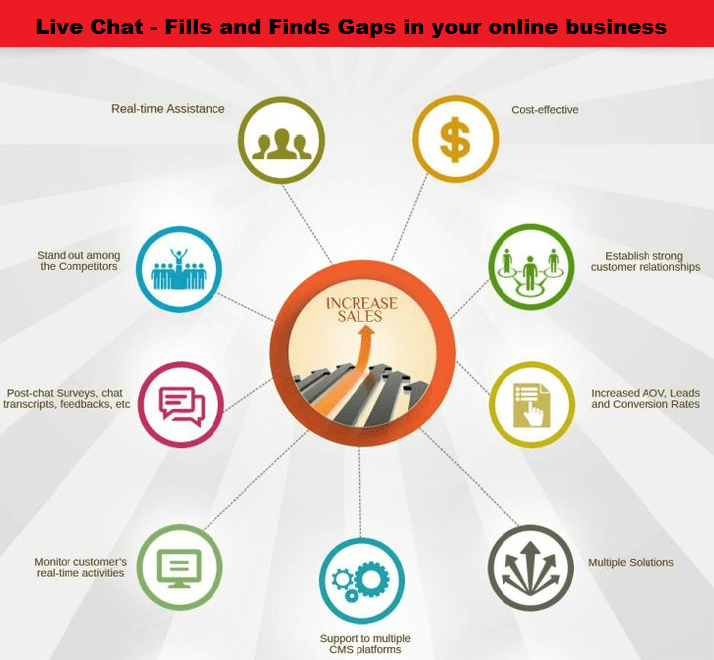 Live chat increases sales is a well proven fact over the past couple of years. Sales often takes a dip when the user feels alone in his journey to buy some product. And that is the gap that we are talking about. By engaging customers at key drop off points, maybe like where you widen the search parameters or include more content, you can stop a customer from abandoning the shopping journey with time relevant and valid help. A high bounce rate is not good for any website. Another major gap in your online business is if the users don’t like your interface or feel lost. Don’t let your customer bounce off your pages, offer them live help and make sure you secure the sale the first time itself. With DLS, you can not just enhance Live Chat support but with the SEM and SEO services we offer, you can get the right people to reach you for the things you have to offer. Now disloyal customers are a setback to any business, which is a well known fact. One might argue as to how it is discoverable by Live Chat Support. The answer is very simple, personal connection between two humans can help you extract the revelant information you need to know from the user about how they like your service. Of course, there are feedback forms, but the moment the user feels dissatisfied if he talks to an agent it can help you realise more legit feelings. Live chat support ensures that a customer feels valued and that they have trust in the business. Conversion is another gap that links closely to bounce off. But is a different thing altogether. Just like in a real life shop, you are more likely to convert a prospect to customer if you go and talk to them and offer help. Online is no different. By engaging in real time, each visitor feels valued and the trust built will give you lasting relationships and brand champions. You might be good, excellent product range and nice quality. But the gap sometimes is the competition. Let’s assume a scenario. You have a website where you sell stationery for example. A customer reaches your website, visits a couple of products and with his navigation style he looks interested but confused. A live chat agent hooks in on a personal message and finds out that some other website is offering a great deal with notebooks and he is trying to find a similar one. Something like this he would never write to you on email, he would just go and buy the product elsewhere. With this you don’t just retain a customer but you can better decide on things you need to include and things you don’t. And such data you get first hand not from any detailed researches and papers.